I’d heard Heid’s name around some before I first saw her read at Literary Death Match. Literary Death Match is this fantastic event run by Adrian Todd Zuniga and his nefarious posse of local organizers, which places writers in bars and boxing rings in mock competition, judged by locally famous judges, with a decidedly questionable final showdown round. It is one of the few events that I try to always get to, because I get to experience the most wonderfully surreal combination of serious, comedic, and completely surprising. 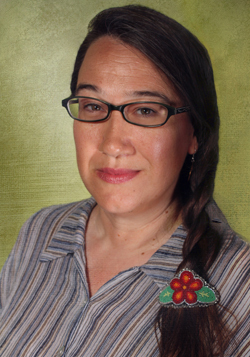 Heid E. Erdrich writes, teaches, and collaborates with other artists across genres. She is author of four poetry collections, most recently Cell Traffic: New and Selected Poems. A recipient of awards from The Loft Literary Center, the Archibald Bush Foundation, Minnesota State Arts Board, and First People’s Fund, among other honors, Heid won a Minnesota Book Award for National Monuments in 2009. She is a 2013 Artist of the Year honoree from City Pages Minneapolis. Heid’s newest book Original Local: Indigenous Foods Stories and Recipes from the Upper Midwest is selling like Grandma Gourneau’s Corn Cakes! Heid’s performance in the Nomad cemented for me the fact that I wanted to collaborate with her somewhere in the future. Her piece was political and visceral and heartfelt and present, in a way that writers in this scene rarely are. Her poem for this week’s Ring Ring is like that, vibrant and present and awake. She wrote the piece for Frank Big Bear, and if you’ve never seen his paintings, when you hear Heid’s poem, you will know and love his work.